With hundreds of thousands of units sold to date, the Hide 'Em In Your Heart series has become one of the most trusted children's music brands in the Christian marketplace! 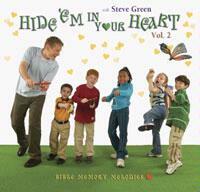 Featuring Steve Green and lots of kids, these songs were written and produced by Frank Hernandez with catchy melodies and creative arrangements to help children easily memorize kid-friendly Bible verses. This 2nd volume helps kids (and parents) learn 21 more wonderful scriptures! Scroll down and click on the song titles below for LYRICS and more DETAILS. Selecting the 'Buy' button will take you to 'iTunes' where these songs can be purchased!